Over the last six months, we've been holding a variety of charity events to help raise money for Ataxia UK; an amazing charity that funds research and supports those with Ataxia. We managed to raise over £2,200 for the charity and we're so proud to have been able to work with them for as long as we did. The word ‘dementia’ describes a set of symptoms that may include memory loss and difficulties with thinking, problem-solving or language. These changes are often small to start with, but for someone with dementia they have become severe enough to affect daily life. Alzheimer’s disease is the leading cause of these symptoms. Alzheimer’s society provides support to those who suffer with the disease while also funding research into a cure. 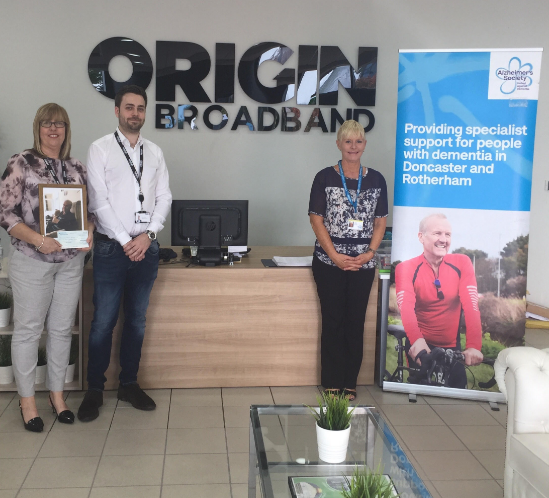 It's a charity that's very personal for us at Origin, as a lot of our colleagues have seen family and friends affected by Alzheimer's. Even before the society became our chosen charity, a few members of Origin had been helping out wherever they could. Some of us, including our CEO Oliver, recently took part in a sponsored memory walk this month in support of Alzheimer's society. Not only that, but earlier this year Oliver and his mum Lynn raised £1,000 for the charity during Dementia action week. The donation was made in loving memory of Edward Purcell, Oliver’s Grandad, who had recently died from the disease at 80 years-old. It's been a great journey, and we're not stopping now either. We've got loads of new events coming up to raise money for Alzheimer's society, including our Halloween extravaganza, our classic Christmas jumper day and even more exciting stuff to be announced soon. If you want to contribute to this cause as well, just click here to make a donation and find out more about how you can help.